Much of my adult life I have wanted to be one of those people who makes bread. I don’t know where the idea came from. My mom never baked bread. She was very happy to buy store bought bread. Baking was not her thing. Her idea of baking was to buy the Pillsbury ready made cookie dough. And even that was too complicated for her baking skills since half the time the cookies were burned on the bottom or too hard to enjoy. My first attempt at baking bread was about five years ago. It went lousy. I was unable to believe that sticky, elastic dough could be transformed into a smooth round mound. I did not knead long enough. My first bread was dense and somewhat flat. Like my bread my confidence was deflated. It was not until a few years later that I attempted to make bread again. The second time I had patience in the kneading process. I patiently pushed down dough on the floured counter and flipped it over and repeated again and again. 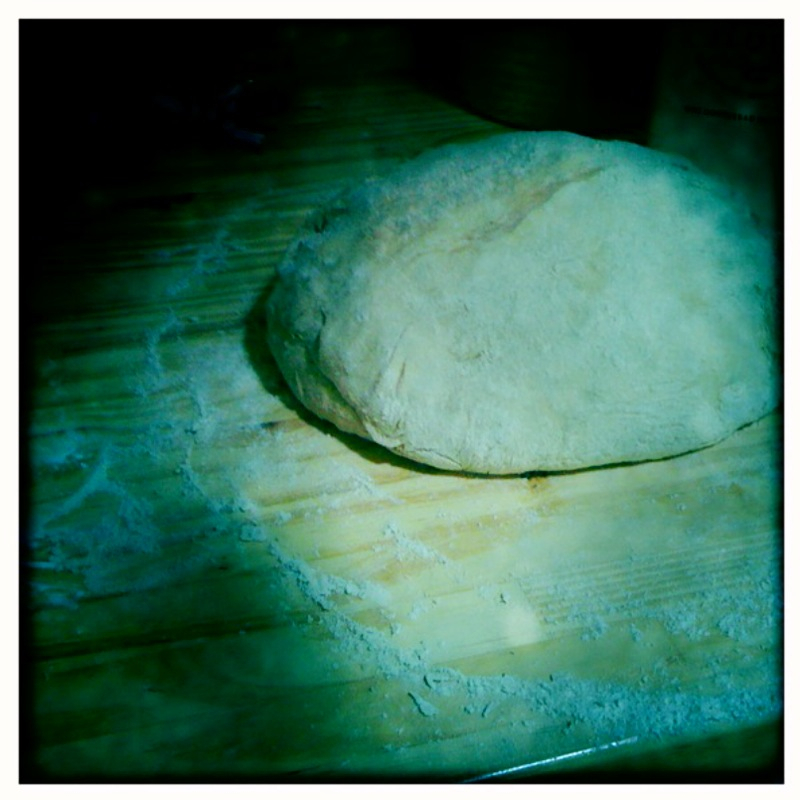 The dough sat on the counter undisturbed to rise. It rose over the sides of the bowl. The aroma of fresh bread floated around the house flirting with our senses. The water footprint of a slice of bread is 11 gallons of fresh water. When I bake my own bread I control the source of the ingredients. The honey is from the neighbor who ladles the golden delight straight from hives. The flour is organic. Organic regulations disallow synthetic petroleum based fertilizers or chemicals pesticides. The butter comes from pasture raised raised cows from Petaluma, California that I buy from the farmer’s market. I know my bread is made from green water sources, rain water. My bread does not taint fresh water sources with chemical or nitrogen runoff. Each week I pass the bread section of the grocery store. I bake all our family bread. The kids call it mama’s bread. I have arrived. I am now that person who bakes their own bread. I offer you my favorite bread recipe. This recipe makes three loaves. I can count on one loaf disappearing the first day. 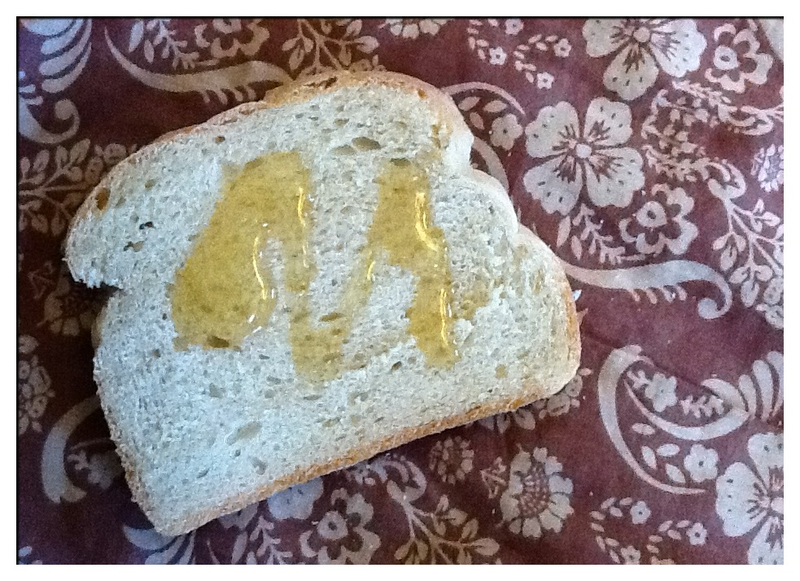 The steam rises from the slices of bread when lathered with generous amounts of butter and drizzles of honey. The second loaf is reserved for the weeks sandwiches. The third loaf is frozen for the following week sandwiches, so I need to make bread only every other week. I purchase the flour from the bulk section of the market. There are farmers who will sell flour direct. For residents in the Paso Robles area, In the Grain dry farms organic wheat. You can find your own producers near you. When you seek you will find. Mix warm water, yeast and 1/3 cup honey ( reserve the additional 1/3 honey for later in the recipe) and 5 cups white organic flour. Stir ingredients to combine. Set the bowl aside for 30 minutes or until the flour resembles big bubbles. Once the mixture is ready mix in 3 tablespoons melted butter, 1/3 cup honey and salt. Stir in 2 cups of the wheat flour to begin. Flour a clean surface with whole wheat cloud and begin to knead adding the additional 2 to 4 cups whole wheat flour. You want to knead the dough until it is no longer sticky ( trust me it will happen). Place round, smooth dough into a greased bowl to keep the dough from sticking. cover with a dishtowel to keep out drafts. Leave the dough to rise. The dough will double in size. Punch the dough after it has risen (I love this part). Divide the dough into the equal parts. Grease three 9×5 inch loaf pans. I use butter to grease but you can use oil too. Place the dough in the pans and allow the dough to rise a second time. You know the dough is ready for to be baked when the dough rises above the pans. If you do not have loaf pans. You can hand form the dough ( fancy way to say just stretch the dough out to resemble the shape of a loaf of bread) and place on a greased cookie sheet. Bake at 350 degrees for 25 to 30 minutes or until the bread has a hollow sound when tapped with a wooden spoon. Lightly brush the tops of loaves with two tablespoons melted butter to prevent crust from getting hard. I’m so interested in your blog! I’v just discovered it, but the concept is very interesting to me! Thank you for all of the information you’re providing! On a note to this post, you’ve given me inspiration. My mom was not much of a baker but for some reason, I desire to bake our own break at home (now I have a logical & ecological reason.) I have tried multiple times & failed horribly; inevitably I wind up with dense bread. I’ll give your recipe a shot here. I’ve heard that practice makes perfect so I’ll try again! If I can make bread anybody can given my own baking roots. Please let me know how the recipe turns out for you. Can you use this for pizza dough or is there a different recipe? Different recipe for pizza. I have a favorite I use for pizza Fridays. I will post soon.